At the Grand Canyon of the Yellowstone, marvel at the world’s most spectacular combination of rainbow-colored canyon walls and breathtaking waterfalls. 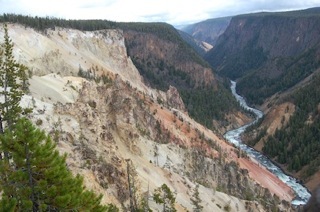 For an unusual and uncrowded view into the Yellowstone River canyon across the river from the busy Tower Fall area, take the Specimen Ridge Trail from the Yellowstone River picnic area. You can see Calcite Springs and sometimes spy osprey or peregrine falcon nests in the canyon. Horses are available at Canyon, Mammoth, and Tower-Roosevelt Junctions, for hire from the park concessionaire. Opened at the end of August 2006, the beautifully upgraded Canyon Visitor Center displays the volcanic source of Yellowstone’s wonders in ways that all can understand. Exhibits about the caldera eruptions, subsequent lava flows, glacial effects, and earthquakes bring you up to date on scientific knowledge about the park’s geology. Don’t miss it when you visit the Canyon area! There’s more about what to see and do at and in the vicinity of the Grand Canyon of the Yellowstone in Yellowstone Treasures, fourth edition, pages 179-188. Here is the Canyon Area: Village and Falls map from that section of the guidebook. Please keep calm about Yellowstone Caldera activity! Comments Off on Please keep calm about Yellowstone Caldera activity! 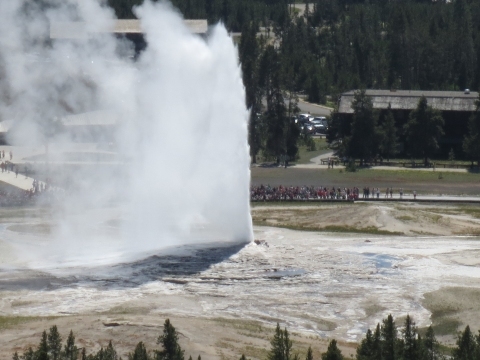 The lovely picture at the head of the article is of Porcelain Basin at Norris Geyser Basin. Here’s our chance to listen to one of the foremost authorities on what’s under Yellowstone explain what is known about the volcano. Jake Lowenstern, U.S. Geological Survey scientist-in-charge of the Yellowstone Volcano Observatory, will talk tomorrow evening, January 23rd, at 7 pm PST about the latest understanding of earthquakes, uplifting ground, and steam explosions in Yellowstone’s caldera. He will also talk about the amazing geological history of Yellowstone National Park and how scientists are monitoring the area in order some day to be able to forecast eruptions.